Mark Collins is neither lawyer nor politician, but he did much heavy lifting to keep the Seahawks in Seattle. He continues to bear the burden of the loss of another fan, his wife Jen. Super Bowl Sunday happens to fall on Feb. 2. If the Seahawks defeat Denver and win the franchise’s first NFL championship, there’s no doubt Groundhog Day will forever be thought of as the biggest day in Seahawks history. It also would put a bookend of sorts on a story that started on another Groundhog Day 18 years ago. Feb. 2, 1996 was the day then-Seahawks owner Ken Behring announced he was moving the team to Southern California. That he would ultimately be unsuccessful is owed to many things, including an already formed grassroots fan group called Save Our Seahawks (SOS) that would become a permanent pain in Behring’s backside. Seattle native Mark Collins started the organization in December 1995 after several media reports indicated Behring was going to try to move the team. Collins publicly vowed to fight Behring, on behalf of the fans, every step of the way. If Behring had any doubt about Collins’ tenacity, all he needed to do was ask someone who knows him. Or ask Collins himself. By the time Behring announced his intentions, Collins had the wheels in motion for a class action lawsuit on behalf of fans against the Seahawks. The suit was filed four days after Behring said he was leaving town. From that point, Collins became a zealot. He took out a mortgage on a house he already owned. He ran up credit card debt and took huge chunks of time off work. Today, in a time when thousands of fans will line roads to the airport simply to wave to the team buses as they drive by for a flight to New York City, this sounds like a fun job. But things were very different in Seattle in 1996. The Hawks weren’t very good on the field and struggled to sell tickets at the Kingdome. The sports landscape in Seattle was dominated by the Mariners and the Sonics. The Seahawks were a weak fourth, behind Washington football, in terms of fan interest. Collins was ceaselessly beating the drum to save a team that many fans were no better than lukewarm about. Collins is not a polished professional public figure. He dropped out of high school and makes his living as a contractor. He’s a blue-collar guy who spends free time playing drums in a country music band. He suddenly found himself in meetings with major players on all sides of the Seahawks story. His blunt demeanor in those meetings often caused concern. Collins and his friends ultimately were on the right side of history. When Paul Allen in 1997 agreed to buy the franchise from Behring, they celebrated with the rest of the city. The victory gave him time to get his life back in order and pursue his two passions: The Seahawks and his soon-to-be wife, Jen. The two met before Collins led the SOS fight. Jennifer helped him throughout the process. They dated for several years. Although he was crazy about her, he didn’t want to get married. He finally caved on New Year’s Eve 2000. The couple was married a few weeks later in Reno. They settled into a nice life, Collins working as a contractor and Jen working as a bookkeeper for a restaurant. Their social life revolved around his country music band and the Seahawks. In 2004, Jen was diagnosed with lung cancer. She was strong-willed and with a positive attitude. It helped for a while. But by the time the Seahawks played Carolina in the NFC championship in January 2006, doctors told her it wouldn’t be safe for her to sit outside for a football game. Friends intervened, and Mark and Jen were able to watch the game (on her 36th birthday) together in a luxury suite. It was Jen’s last Seahawks game. Traveling to Detroit for that year’s Super Bowl was out of the question for Jen, and something Mark says he never considered. “She told me to go, but there was no way,” he says. The team his organization had helped save was playing in the ultimate game, and he would miss it to stay with his wife. Jen Collins died later in 2006. Mark still carries a torch for the love of his life. That may be true. But someone can wear her jacket. That someone is Mark Collins. 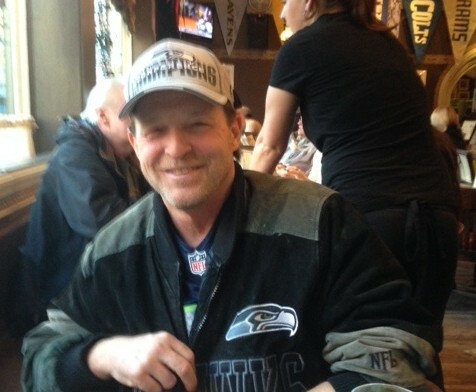 He’s going to Super Bowl XLVIII, and plans on wearing what he wears to every game: Jen’s old Seahawks jacket. Bad luck in the ticket draw left Collins with a not-so-choice seat. He will sit in the last row of the upper deck of the end zone. He’ll be in the stadium, but he’ll be as far away as you can get from the team he loves. He’ll also be closer to the woman he still loves, who helped him and others save the Seahawks. Great article, Gas. I remember back in the mid-90s when the Seahawks were an afterthought, lost amidst the “Refuse to Lose” Mariners mania. Going to the Kingdome in those days…and to Husky Stadium in 2000 and 2001, it seemed like the only fans attending were the blue collar die-hards like Mr. Collins. These days I’m struck by how the Seahawk fandome cuts across all age, economic and gender demographics…whether it’s a lawyer on the Eastside or a high schooler in White Center…it seems everyone is sporting the blue and green. Thank you Mike, that was a gem. How I remember the gloom of those days, when it seemed the Seahawks leaving was inevitable. Thank you, Mr. Collins (and your organization), for your hard work and persistence. Must be some way to get this guy a seat upgrade. The Twelve-est of the 12th Man to represent us all. How about it, Seahawk organization? Here’s a great, ready-made, Super Bowl PR story for you. Surely you can find a way to squeeze one more into the luxury suite? we will never forget all of your efforts and love for the Seahawks…. nor will we ever forget your beautiful Jen. Thanks for this great story! This is my single favorite I have read yet among all the other media nonsense leading up to this game. Thanks for telling the Collin’s story, Mike. Two of the nicest people you would ever know. Have fun at the game, Mark! Think of you and your amazing wife all the time and so grateful for your stubborn streak! GO HAWKS!!! Great article Gas! Mark did so much to rally fans behind the scenes as the force behind Save Our Seahawks and it is good to see him remembered unlike other media outlets in town who forgot who he was when they wrote their articles. I hope no matter whatever happens with this team people remember that the beginning of the 12th Man was when fans voted for the stadium after Mark and Mama Blue and I banged the cages in Olympia when there was no appetite for another sports facility after Key Arena and Safeco. The Seahawks truly are the fans team! Nice article but why wasn’t anything written about his current relationship with the team. You would think that somehow a guy who was monumental in keeping the team in town could get a decent ticket to the game. It sounds like he’s getting the worse seat in the house. Is that an indication of Paul Allen’s gratitude. It almost sounds like they tossed him into the scrap heap. Thanks Mike for the great write — And thanks to everyone else for ther ever so kind comments. As of right now, I do not have a ticket – just couldn’t see myself sitting in the very last row at the top – not sure why the Seahawks did that that, but I am sure they had a reason. I hope to find a ticket in the 200 or 100 level that is not to overpriced. Leaving Friday AM – with or without a ticket — someway I will find a ticket for myself & Jen’s coat – and she will be right there with me in spirit — GO HAWKS ! Fan of Do Gooders Eveywhere! You are awesome! Going to post this on some of the 12th man pages, we need to get you a proper ticket!